I've finished another small game aid that is available, for free, at DriveThruRPG. Sometimes it is fun to have a little mini-game within another game. A common mini-game is some sort of card game. You could use regular cards, but if you are playing a fantasy RPG you might want to use a fantasy based card set. 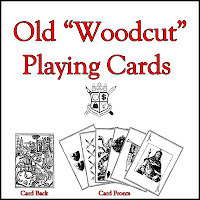 These cards are simple black & white cards meant to resemble a simple woodcut reproduction. I could see using a parchment-colored heavy cardstock, cut out the cards, and cover them in some type of varnish or protectorant. These cards could have been cleaned up some to make them more user-friendly with simpler layout for reading card values, but the older-style layout is very deliberate. Hopefully you'll be able to get some great use out of them.